With the beginning of a new year comes the beginning of a new series. I’ve spent hundreds of hours (not an exaggeration) enthralled in game film sessions, reading player profiles, scrounging through stat sheets and scanning the histories of all the NFL franchises. I hope you enjoy it as much as I have. Welcome to One Team, One Jersey. As a jersey collector and connoisseur, I am constantly expanding my repertoire and so I thought I should probably expand my search to all the teams of pro football. Buying every jersey I want would be too expensive though. Picking one for each team is reasonable and so became the idea that is One Team, One Jersey. The player you choose must have played for that team more than any other AND must have been on that team’s roster during the 2017 season. Aside from that, it’s up to you what you prioritize: character, statistical production, championships, a combination of the three. Your call. The NFL was introduced to the Baltimore Ravens in 1996 when Art Modell decided to move the Cleveland Browns to Baltimore. All Browns records and their history was left behind in Cleveland and the Ravens were considered an expansion team. With that categorization, the Ravens became one of the most successful expansion teams in sports history. Their first ever draft picks were left tackle Jonathan Ogden and linebacker Ray Lewis. The two Hall of Famers had 24 Pro Bowl seasons combined, giving Baltimore the framework from the beginning of a contender. Since the Ravens’ induction into the NFL, Baltimore has won two Super Bowls and 15 playoff games. It takes some expansions teams five or six years just to be competitive. Baltimore has achieved these heights in 22 seasons. They may be one of the younger franchises in the league, but Baltimore has come to play more often than not and their youth has put a chip on the team’s shoulder, the type of motor that attracts fans. It was difficult to pick a jersey for Cincinnati and Cleveland. There are plenty of options in the stronghold of Maryland. For example, it would be unfair to make this list and not include Marshall Yanda, who made six consecutive Pro Bowls beginning in 2011. He was named the top guard by Pro Football Focus in ’14, ’15 and ’16. If that doesn’t demonstrate how dominate he’s been in the trenches, I’m not sure what does. The team is lacking on offense, but a 2008 first-rounder from Delaware is still behind center. Joe Flacco had one of the greatest playoff runs in NFL history in 2012, tying Montana’s record with 11 touchdowns and zero interceptions in the same postseason. He’s played in some rather large postseason contests. He’s gathered playoff victories on the road. The argument goes, and I believe it to be the right one, that many of those playoff victories came on the back of an elite defense, not on the shoulder of a quarterback named Joe. He’s made big throws in big moments, but the Ravens did not beat the Patriots because Flacco outdueled Brady. In his ten-year career, Flacco has thrown for 25 touchdowns only twice and broached the 4,000 yard plateau once. He’s the best quarterback Baltimore has ever had and that earns him sentimentality points and a spot in Ravens lore, but in actuality, he was never elite, nor extraordinary. Not the type of player you buy a jersey for. For years, he’s been one of the game’s most overrated signal callers and one historic postseason doesn’t diminish that argument the same way Josh Gordon leading the league in receiving yards doesn’t mean he’s an otherworldly talent. Success is temporary and professional athletes are expected to reach it from time to time. Those who reach it regularly are elite and they reach these heights on their own merits. Brady never won MVPs because his defense was top-five. Peyton didn’t set passing records because Ray Lewis was phenomenal at playing middle linebacker. Joe Flacco isn’t in the same realm as these two legends and you can argue it if you want, but he’s not. He’s had a passer rating above 90 twice. He’s serviceable for the most part, although these past three seasons have been difficult to watch considering his Zeppelin of a contract. Ten years after his career is over, Ravens fans will remember the name with pride but football fans will remember the Mile High Miracle and the 2012 Super Bowl and think of that one great year he had. There’s a reason that’s the case. Besides, Baltimore has always been known for its staunch defense and so it only feels right to pick a player on that side of the field. Brandon Williams is quite the presence at defensive tackle. CJ Mosley has proven to be a fine successor to new HOFer Ray Lewis in the middle, making three Pro Bowl rosters. Jimmy Smith has been close to a top-ten corner for a majority of his career. He’s not quite a tier one star, but is a reliable player that can go one-v-one against most receivers. There’s still one big name we haven’t mentioned, one of the most dominant edge rushers of the last 20 years. There were three elite players on the Ravens’ defenses of the 2000s: Ed Reed, Ray Lewis and Terrell Suggs. In my eyes, Suggs should be in the Hall. He played with a ferocity and aggression that personified the Ravens grit and tenacity and plays with that same motor today. Suggs is one of only 37 players to win Defensive Player of the Year, a true honor for a terrorizing player. He also holds the Ravens franchise records for sacks (125.5) and forced fumbles (29) by wide margins. Those 125.5 sacks put him 17th on the all-time quarterback takedown list. He was unanimously named Defensive Rookie of the Year in 2003 after setting a franchise rookie record with 12 sacks. He’s a seven-time Pro Bowler and a Super Bowl champion. 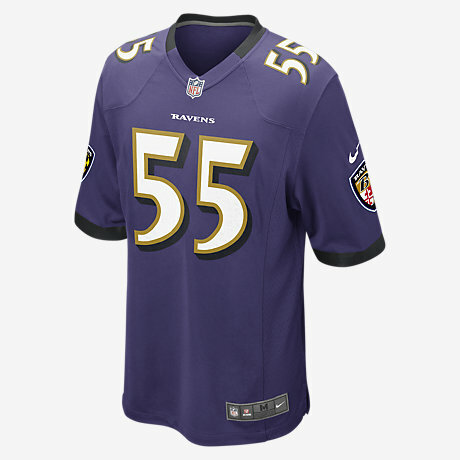 Routinely voted as one of the most hated players in the NFL, Suggs also carries the charisma of a performer, often putting opponents on edge with sack dances. Maybe he’s dirty, maybe he’s passionate. Maybe he just shows no mercy. Whatever it is, ain’t no one ever doubt his effort or his compete level. No one looks forward to playing that guy. That hostility, that grit, personifies the Ravens. My pick: Terrell Suggs. My jersey: Home Purple.